One of the best — and most easily available — ways we can become healthier and happier is through mindfulness and meditation. Every element of well- being is enhanced by the practice of meditation and, indeed, studies have shown that mindfulness and meditation have a measurable positive impact on the other three pillars of the Third Metric — wisdom, wonder, and giving. When I first heard about mindfulness, I was confused. My mind was already full enough, I thought — I needed to empty it, not focus on it. My conception of the mind was sort of like the household junk drawer — just keep cramming things in and hope it doesn’t jam. Then I read Jon Kabat- Zinn’s writings on mindfulness and it all made sense. “In Asian languages,” he wrote, “the word for ‘mind’ and the word for ‘heart’ are the same word. So when we hear the word ‘mindfulness,’ we have to inwardly also hear ‘heartfulness’ in order to grasp it even as a concept, and especially as a way of being.” In other words, mindfulness is not just about our minds but our whole beings. When we are all mind, things can get rigid. When we are all heart, things can get chaotic. Both lead to stress. But when they work together, the heart leading through empathy, the mind guiding us with focus and attention, we become a harmonious human being. Through mindfulness, I found a practice that helped bring me fully present and in the moment, even in the most hectic of circumstances. I love the image of gently escorting my mind back to the present moment — without any negative judgment that it wandered. It will, no doubt, be a familiar process for anybody who has parented or babysat a toddler, which is not a bad comparison for our modern multitasking minds. As for meditation, it has long been an important part of my life. My mother had actually taught my younger sister, Agapi, and me how to meditate when I was thirteen years old. But although I’ve known its benefits since my teens, finding time for meditation was always a challenge because I was under the impression that I had to “do” meditation. And I didn’t have time for another burdensome thing to “do.” Fortunately, a friend pointed out one day that we don’t “do” meditation; meditation “does” us. That opened the door for me. The only thing to “do” in meditation is nothing. Even writing that I don’t have to “do” one more thing makes me relax. I’ve found that meditation can actually be done in very short windows of time, even while on the move. We think of ourselves as breathing, but, in reality, we are being breathed. At any time we choose, we can take a moment to bring our attention to the rising and falling of our breath without our conscious interference. I know when I have “connected” because I usually take a spontaneous deep breath, or release a deep sigh. So, in a sense, the engine of mindfulness is always going. To reap the benefits of it, all we have to do is become present and pay attention. Our breath also has a sacredness about it. Sometimes when I’m giving a talk, I’ll first ask everyone in the room to focus on the rising and falling of their breath for ten seconds. It’s amazing how the room, which moments before hummed with chaotic energy, will suddenly be filled with a stillness, an attentiveness, a sacredness. It’s something quite palpable. There are many forms of meditation, but whichever form you choose, it’s important to remember that its benefits are only a breath away. And the only price we pay is a few moments of our attention. My sister, Agapi, has always been a natural on all matters spiritual, and has been my guide throughout our lives, sending books and people my way, nudging my spiritual explorations, calling to wake me up at a hotel in Kalamazoo, Michigan, at five in the morning so I could have time to meditate before another grueling book- tour day began. When I was growing up, meditation was seen as a cure for just about everything. My mother had convinced us that if we meditated, we would be able to do our homework faster and improve our grades. We knew that meditation made us more peaceful and less upset when things didn’t go our way, but we also realized that it made us happier. And now, science has provided evidence to back this all up. If anything, my mother was underselling the benefits of meditation. Science has caught up to ancient wisdom, and the results are overwhelming and unambiguous. What study after study shows is that meditation and mindfulness training profoundly affect every aspect of our lives — our bodies, our minds, our physical health, and our emotional and spiritual well- being. It’s not quite the fountain of youth, but it’s pretty close. When you consider all the benefits of meditation — and more are being found every day — it’s not an exaggeration to call meditation a miracle drug. It’s the Swiss army knife of medical tools, for conditions both small and large. A study funded by the National Institutes of Health showed a 23 percent decrease in mortality in people who meditated versus those who did not, a 30 percent decrease in death due to cardiovascular problems, and a significant decrease in cancer mortality. “This effect is equivalent to discovering an entirely new class of drugs (but without the inevitable side effects),” observe Mark Williams and Danny Penman. Another study found that meditation increased levels of antibodies to the flu vaccine, and the practice was also found to decrease the severity and length of colds, while researchers at Wake Forest University found that meditation lowered pain intensity. How does it do all this? It’s not about just distracting us from pain and stress; it literally changes us at the genetic level. Researchers at Massachusetts General Hospital, Beth Israel Deaconess Medical Center, and Harvard Medical School found that the relaxation response — the state of calm produced by meditation, yoga, and breathing exercises — actually switched on genes that are related to augmenting our immune system, reducing inflammation, and fi ghting a range of conditions from arthritis to high blood pressure to diabetes. So with all these results, it’s no surprise that, according to another study, meditation correlates to reduced yearly medical costs. Meditation can also have profound effects on a host of other psychological conditions. Researchers at UCLA found that mindfulness and meditation helped lower feelings of loneliness among the elderly, while researchers from the University of Michigan documented that military veterans experienced lowered levels of post- traumatic stress disorder after mindfulness training. Meditation has also been found to reduce depression among pregnant women and teens. And it’s not just about reducing negative emotions; it’s also about boosting positive ones. 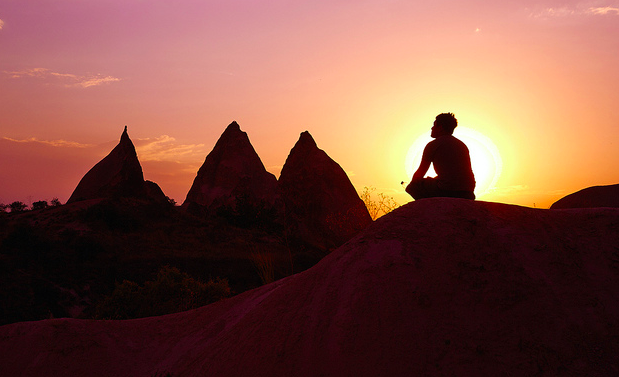 A study led by University of North Carolina professor Barbara L. Fredrickson found that meditation increased “positive emotions, including love, joy, gratitude, contentment, hope, pride, interest, amusement”; it also resulted in “increases in a variety of personal resources, including mindful attention, self-acceptance, positive relations with others, and good physical health.” A study of patients with a history of depression at the University of Cambridge found that mindfulness- based cognitive therapy lowered the risk of depression relapse in participants who had experienced three or more episodes from 78 to 36 percent. Meditation can help us not only focus, but also refocus after being distracted — which is an increasingly common peril of our technology- besieged lives. Giuseppe Pagnoni, a neuroscientist at Emory University, found that, after an interruption, the minds of participants who meditated were able to return to what they had been focusing on faster than non-meditators. “The regular practice of meditation may enhance the capacity to limit the influence of distracting thoughts,” he said. This is especially valuable for those who feel like their days have become a noisy, beeping, blinking obstacle course of distracting thoughts. No wonder mindfulness and meditation are being increasingly adopted by corporations and institutions throughout the world. The Bank of England has offered meditation sessions for its staff as well as the option to enroll in a self- funded six- week meditation course. And in the military, while the United States Marine Corps is experimenting with a Mind Fitness Training program, the David Lynch Foundation’s Operation Warrior Wellness has helped bring meditation to veterans and armed service personnel and their families, leading to a substantial decrease in PTSD and depression symptoms. Padmasree Warrior, the chief technology officer of Cisco, calls meditation “a reboot for your brain and your soul.” She meditates every night and spends her Saturdays doing a digital detox. Warrior drew on her meditation practice to manage twenty- two thousand employees in her previous role as Cisco’s head of engineering. For those who still think of meditation and mindfulness as exotic imports, it’s important to recognize that our Western traditions of prayer and contemplation, and the Stoic philosophy of ancient Greece and Rome, fulfi ll the same purpose as the Eastern practice of meditation. According to Taoist philosophy, “Rest is prior to motion and stillness prior to action.” And every Christian tradition incorporates some equivalent form of mindfulness. In the sixth century, Saint Benedict established the tradition of Lectio Divina (“divine reading”), a four- part practice of reading, meditation, prayer, and contemplation. The Quakers built their belief system almost entirely around what are, in effect, the principles of mindfulness. Believing that the light of God is in everyone, Quakers structure their services, called “meetings,” around silence. There is no leader or minister, and members usually arrange themselves in a circle, facing one another, to emphasize the collective spirit and lack of hierarchy. Meetings, which are open to everybody of any faith, begin with silence, which continues until someone feels moved to speak. But the silence isn’t interstitial or an intermission — it’s the main show. It allows all those present to access their own inner light, and be nourished by the collective silence of the group. In the 1970s, Basil Pennington, a Trappist monk, developed a practice called the “centering prayer.” It entails four steps: 1. Sit comfortably with your eyes closed, relax, and quiet yourself. Be in love and faith to God. 2. Choose a sacred word that best supports your sincere intention to be in the Lord’s presence and open to His divine action within you (for example, “Jesus,” “Lord,” “God,” “Savior,” “Abba,” “Divine,” “Shalom,” “Spirit,” “Love”). 3. Let that word be gently present as your symbol of your sincere intention to be in the Lord’s presence and open to His divine action within you. 4. Whenever you become aware of anything (thoughts, feelings, perceptions, images, associations), simply return to your sacred word, your anchor. It’s remarkable how similar the pathways that connect us with our own being are: the symbols and the mantras differ, but the essence and the truth remain through the ages and across many different continents, religions, and psychological practices. Catholicism includes the rosary, a prayer devoted to Mary, but also a practice about contemplation deepening through ritualistic repetition. Prayer beads are used as a method of releasing the mind by giving the fi ngers a physical focus. Sufism, a mystical tradition of Sunni Islam, emphasizes inner enlightenment and love as the pathways to ultimate truth. It also gave birth to the whirling dervishes, who perform a ritual dance as an offering, a meditation, and an expression of the love of the divine. Judaism also has a long mystical tradition that emphasizes inner wisdom and enlightenment. The twelfth century Kabbalah talks about using meditative practices to “descend to the end of the world,” and thus transcend our external selves and deepen our engagement with the divine. Torah coach Frumma Rosenberg- Gottlieb wrote about leaving her farm in the mountains of Colorado and moving to New York to study the Torah (while also demonstrating that heightened spirituality doesn’t always involve moving from the big city to the mountains). “As I became more sophisticated in my understanding of Torah,” she writes, “I realized that mindfulness and a peaceful, balanced soul is indeed an objective in Jewish life, and that the tools for attaining it are subtly woven into the tapestry of Torah knowledge. I learned, for example, that the Hebrew word ‘shalom’ implies not just peace, but also completion, perfection, wholeness. We bless one another with peace; our daily prayers culminate in a request for peace.” She also notes that meditation in Judaism goes way back, all the way to Abraham’s son Isaac, who, as Genesis 24 tells us, “went out to meditate in the field toward evening” as he awaited his bride- to- be, Rebecca. So no matter what tradition you follow — or if you follow no tradition — there is some form of meditation and mindfulness that can be integrated into your life. And if you want to enjoy the benefits of mindfulness but don’t want to start with meditation, prayer, or contemplation, just go fly- fishing. In fact, I have friends who have said to me, “My meditation is running,” or “skydiving” or “gardening.” But can you create that state of mind at will without having to put on your running shoes, open your parachute, get out your trowel, or cast your fishing rod in the water? The point is to find some regular activity that trains your mind to be still, fully present, and connected with yourself. Just do it regularly and integrate the bene- fi ts into your everyday life. And, of course, throw the fish back — mindfulness shouldn’t be about coming home with a trophy to mount above the fireplace.